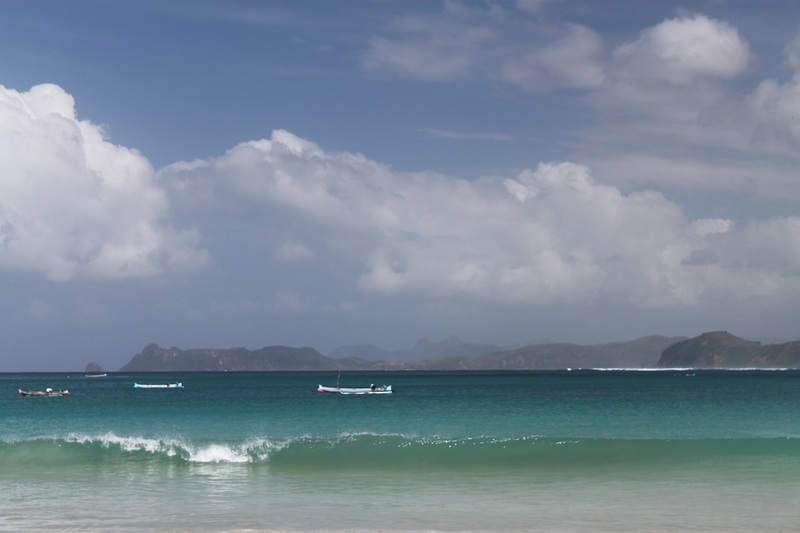 Lombok Beaches Part 2: Paradise Found | What an Amazing World! “How far is Tanjung Aan from Kuta?” I ask the driver who takes us to Kuta Lombok from Senggigi. 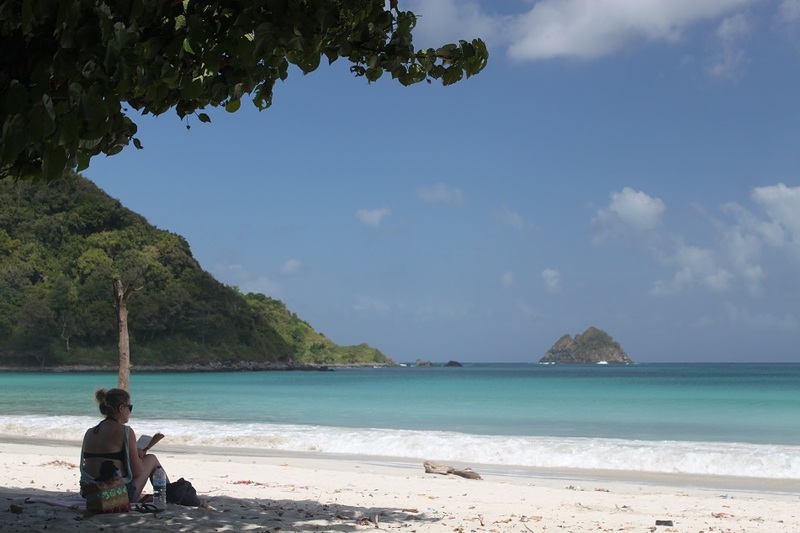 Prior to my visit to Lombok I had asked my friends who have been to the island about the best beaches in Lombok. But none of them ever mentioned Selong Belanak. “Currently there is only one villa there,” the driver reassures us. 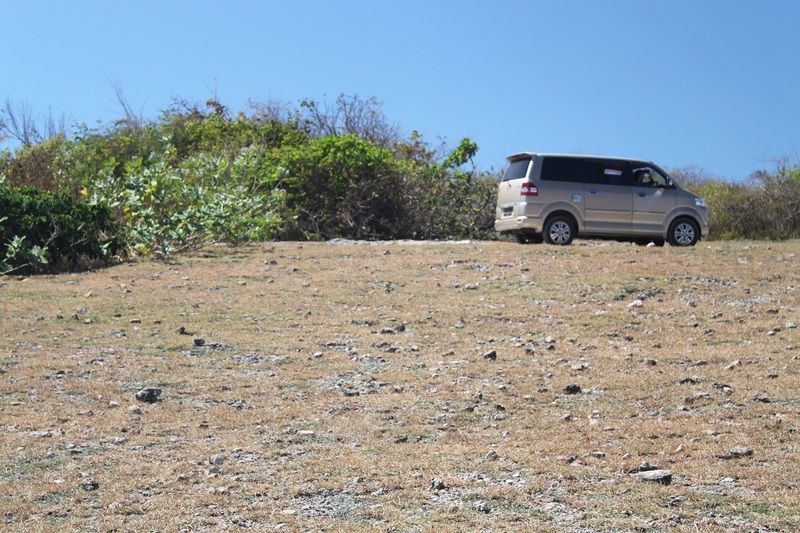 We wind through the dry landscape of southern Lombok, where local men in sarung and women in traditional clothes are doing their daily activities at home or in the fields, on both sides of the road leading westward from Kuta Lombok to Selong Belanak. Schoolchildren sporting happy faces greet us with some of the friendliest ‘hello’s along the way, while buffaloes walk nonchalantly and monkeys stare at passers-by. More hilly compared to the road to Tanjung Aan, our scooter brings me a slight pang of worry when I have to force it to full throttle on an uphill road. Then I look right, the vast expanse of Kuta Lombok spreading below us, only to be replaced by another remarkable view of Mawun Beach a few minutes later. 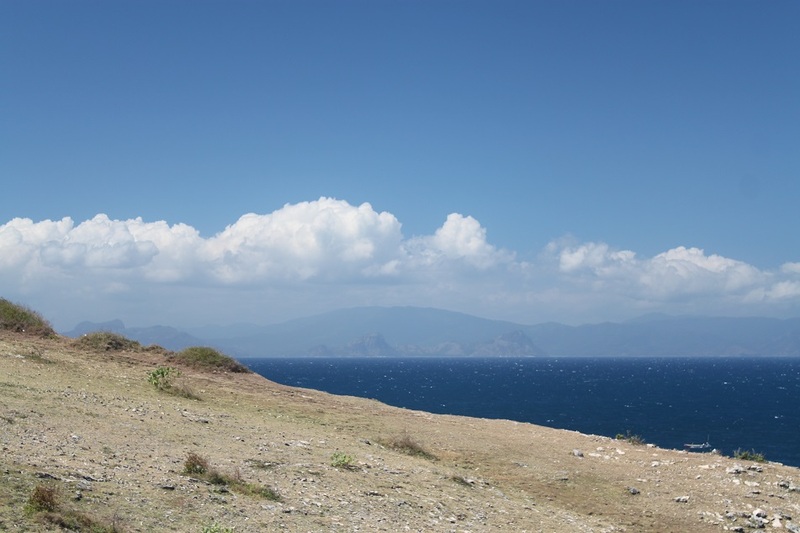 Apart from local people’s houses, the signs of the economic development on this tranquil side of Lombok are evident. 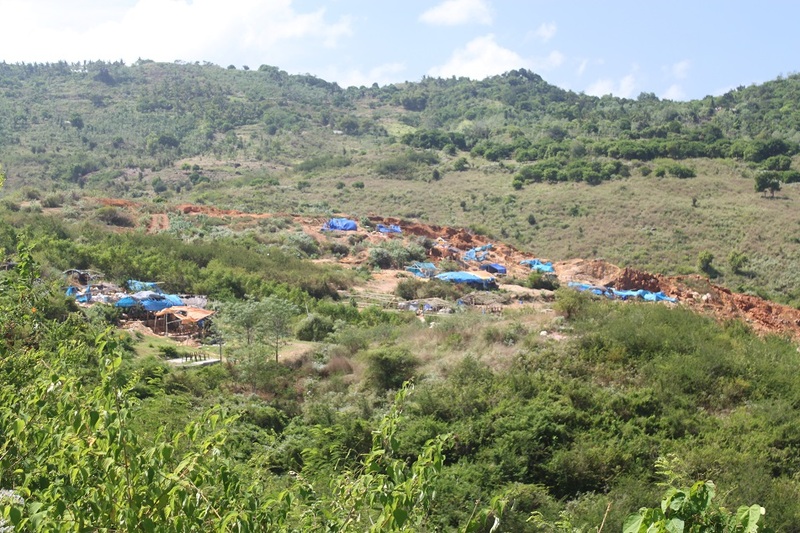 Properties for sale alongside bulldozers and excavators turn the sleepy hills into thriving development areas. We keep going, until 30 minutes later when we are left awestruck with what we see. A wide cove with white powdery sand lies against rows of picturesque verdant hills, creating a dramatic vista unlike other beaches in the area. The water is clear with shades of turquoise and the waves are calm. A group of local fishermen are towing their boats towards the shore, coming home after last night’s hunt for fish. Sunbathers, novice surfers, and a lady with a book in her hands, so many people yet so peaceful and relaxing at the same time. “This is probably one of the most beautiful beaches that I’ve been to,” James tells me while looking out to the ocean. I couldn’t agree more. 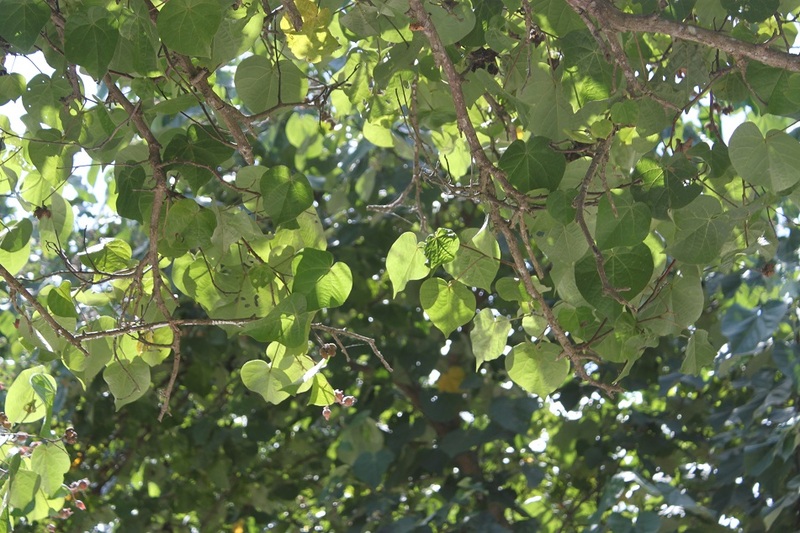 We are sitting on a wooden bench under a Beach Hibiscus tree (Hibiscus tiliaceus), known as waru in many local languages in Indonesia, the same word used by the Javanese to describe the spade in playing cards. I look around, trying to count the numbers of food stalls at the beach. 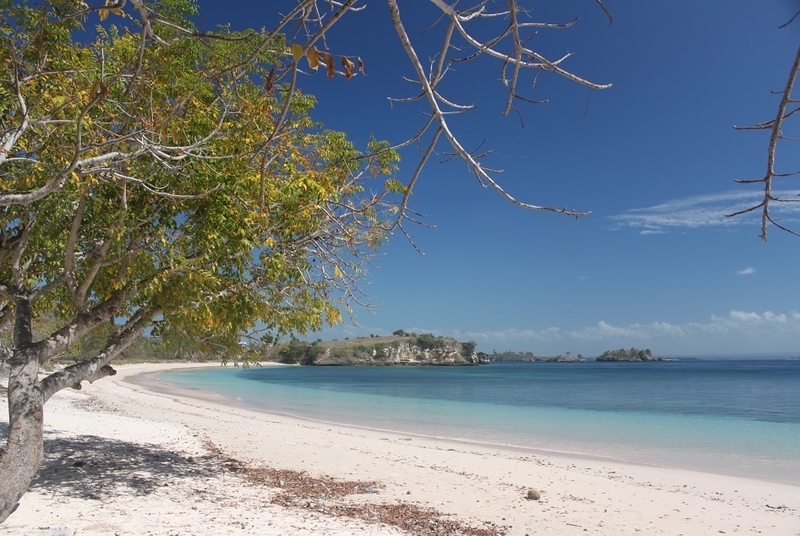 Only 3, a very modest number considering the growing popularity of this stretch of beach in southern Lombok. The breeze is soothing and the cacophony is anything but distressing. We sip our kelapa muda – young coconut – to quench our thirst, at the same time marveling at the sheer beauty of Selong Belanak. Looking at the map of the southeastern end of Lombok I see the arms of an octopus, created by promontories hosting some of the most recommended beaches on the island. It is far and desolate. Patches of tobacco plantations dominate the view on our trip to Tanjung Ringgit and Pink Beach, locally known as Pantai Tangsi, two of the most raved about places in this part of Lombok. The further we go the narrower the road becomes, and the more arid the landscape turns. Our minivan keeps running steadily, until the smooth road changes into a road dotted with countless potholes, significantly reducing the car’s speed. 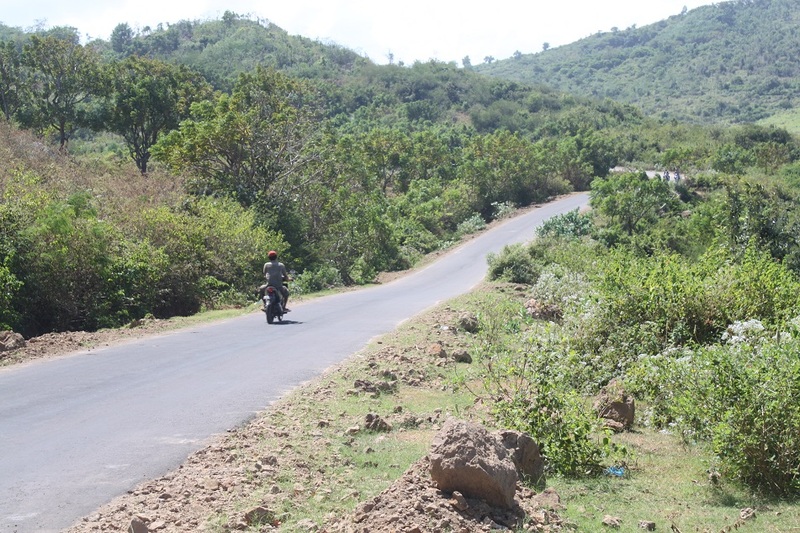 With only a few tourists coming to this corner of Lombok, the roads are desperately needing renovation works, a stark contrast to most roads to Lombok’s main tourism sites. Rows of dried trees with sun-bleached bark stand still on both sides of the damaged road, devoid of life… until I notice small groups of long-tailed macaques. 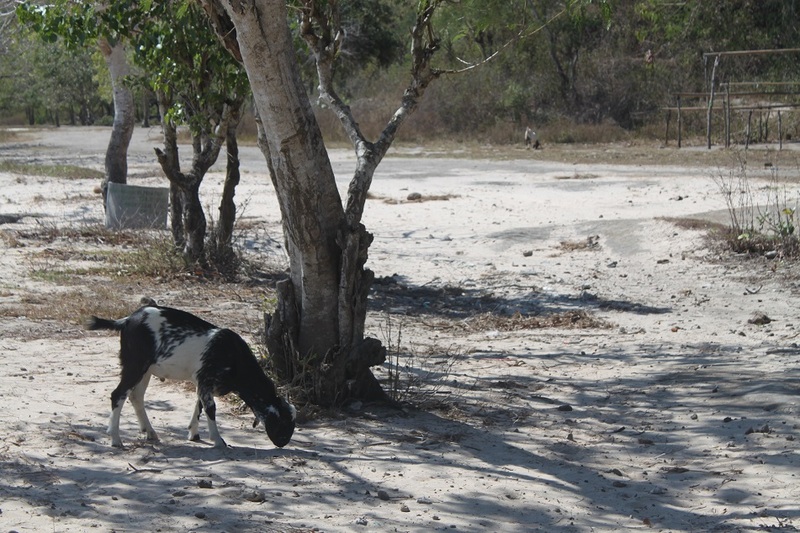 Seemingly curious enough with our presence, the monkeys have little energy to investigate further as in this part of the island fresh water is scarce. They stay put and remain pensive. 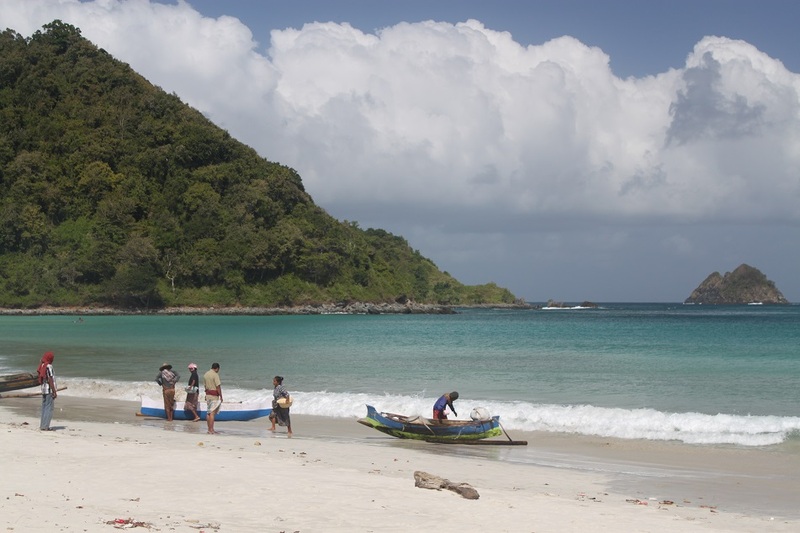 “In this part of the island the water in people’s wells tastes salty,” our guide explains. Going deeper into the dry forest, I notice a wooden security post with a small board attatched to a tree nearby. ‘Tanjung Beloam’ it says, referring to the pristine beach which has been recently turned into a private property, hence the security personnel. A short drive past the security post at Tanjung Bloam, we come to a place where the trees are painted in pink, albeit only a small part of it, such a bizarre sight in the middle of nowhere. Apparently we have almost arrived at Pink Beach. “Do you want to ride a scooter?” a local man asks me, “the beach is still 300 meters downhill,” he adds. “No, thanks,” I politely reply. After what we had experienced in Rinjani earlier that week, such a distance downhill proves a very easy thing to walk, despite the badly damaged trail from the main road to the beach. There is only one food stall, and it is closed for Ramadan. Deserted, calm, peaceful. With no one else besides our guide, we practically have the beach for ourselves, after previously declining the local man’s offer to snorkel to a nearby island. He tells that the pink color of the beach is more visible before 8 am and after 4 pm – by the time we arrive there it is almost 11 am. But looking closer, the red flakes that create the pink hue to this place are clearly visible. James and I walk around, and we find small chunks of dead red corals from which the flakes are formed. “It’s nothing special,” our guide looks around, finding a place to sit. Contrary to what he thought, Pink Beach for us is truly a dream beach. The powdery sand is the softest that I have ever walked on, the water is the clearest that I have ever swum in, and the ambiance is the most soothing that I have ever experienced. All the images of an ideal, crystal clear tropical beach are well-represented by Pink Beach, in every sense. Having the entire beach for ourselves for almost 2 hours, it is easy to lose track of time in the midst of such beauty. More people are finally coming, signaling us that we have spent a lot of time in the water. Walking back to where we put our clothes, we find our guide sitting nearby and watching for our stuff. “Unfortunately I don’t,” I pause a little bit to think of an important message I need to tell him. “It’s better to leave that here, at the beach, because that’s where the pink color comes from. 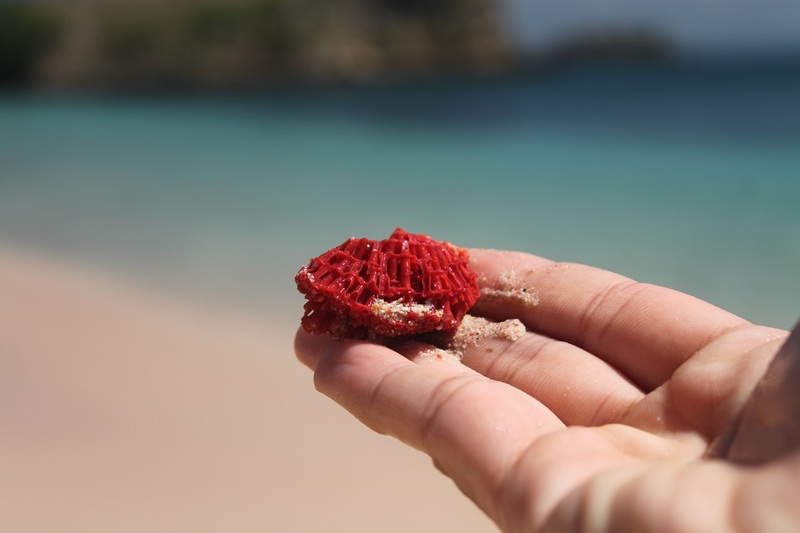 If more and more people take away dead red corals, I’m afraid one day there’s no more Pink Beach, just another beach,” I state my point clearly. Going back to the main road after walking uphill to the car park, we hop into our minivan to continue a bit further east to get to Tanjung Ringgit. Towards the end of the road, our driver skillfully navigates his way through the trail normally passable only by 4WDs. The rocky road sloping down towards the cliff at the edge of the Indian Ocean worries me a little bit. 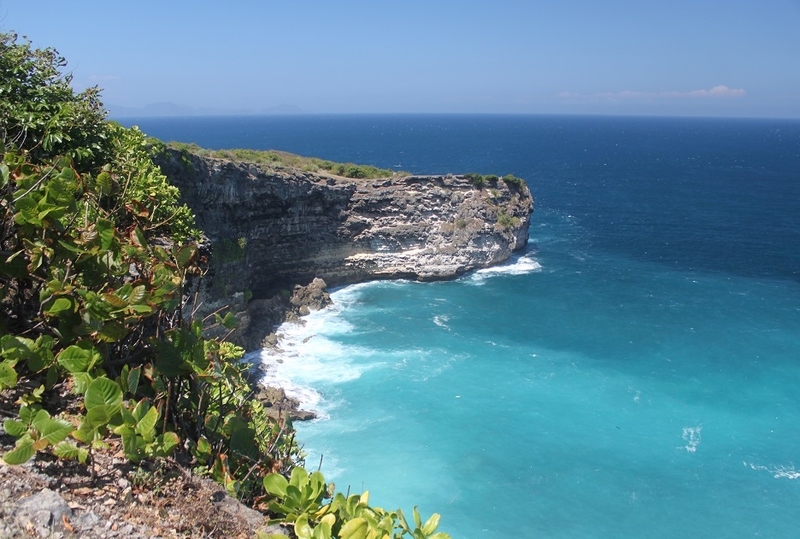 But the view of Tanjung Ringgit makes me feel at ease due to its dramatic landscape. 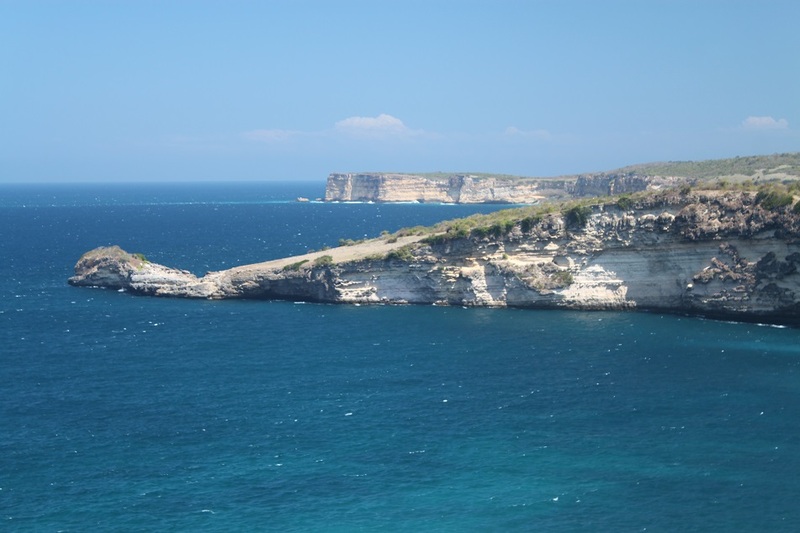 Another blogger even compared it to the Great Ocean Road in Australia. We walk further to the very edge of the cliff, passing through thorny shrubs where a bird resembling a kingfisher flies over, striking us with the beautiful colors of its feathers. 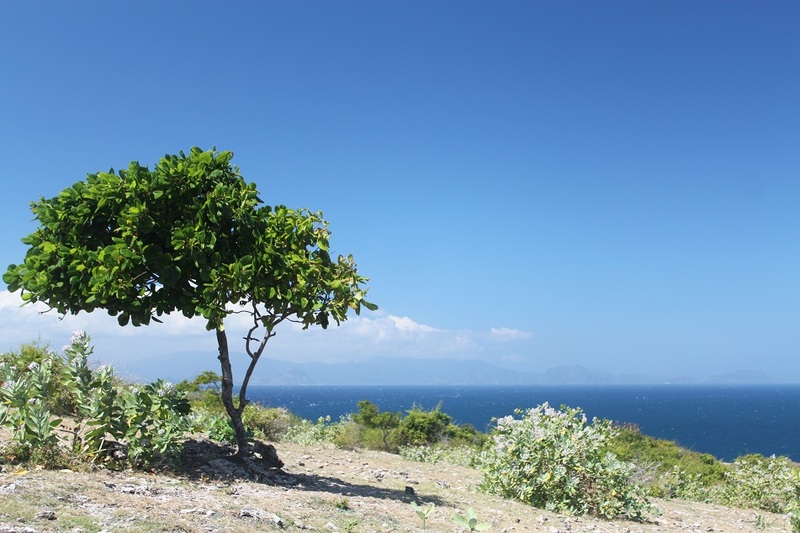 Looking down, the sound of the waves is daunting, but looking left the magnificent view of the neighboring island of Sumbawa tickles my curiosity of how the island looks. After all it is where Mount Tambora, which created the “Year Without Summer” in Europe and North America following the largest volcanic eruption in recorded history, is located. 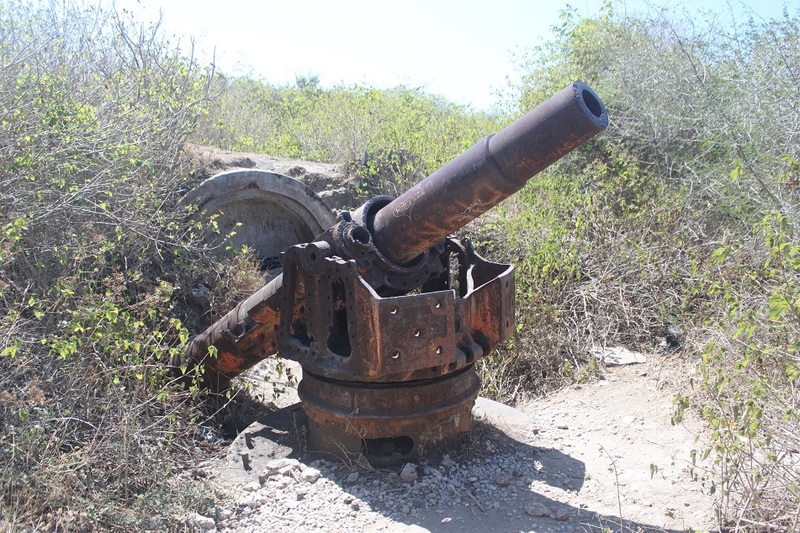 On one of the highest points of Tanjung Ringgit an abandoned Japanese military cannon is rusting and left vandalized by irresponsible visitors. However today this place no longer holds a military role, only a magnificent landscape to be relished. Wow, did you and James plan this together? You’re posts dropped at almost the exact same time! Haha, you noticed. 🙂 Yes, we did. Those beaches were very special for us as we’ve never come across such beautiful and pristine beaches, and it might take a while to find another beach like those. And sometimes I wonder, is it at those times that you’ve allowed your soul to breath and reach out that you discover another beautiful space between earth and sky? Absolutely, in that moment in time Pink Beach was truly a piece of heaven on earth. This is just so beautiful. Thank you for sharing. That’s part of the fun of traveling with you because we took the same pictures but always ended up with different photos and mood. 🙂 You yourself took some pictures from Selong Belanak that I didn’t. Now I really want to go back to Pantai Tangsi! Thanks for the research you did James! I’m glad we found that beach. these places are hidden secrets and hope they stay that way just for people like you, mindful of the environment – great post and the beauty of the places speak through your pictures – thanks !! Thanks Ananta! When we went back to our minivan, a small group of visitors came to the beach by their scooters. I hope they’re also mindful of the importance to keep the beach pristine. The landscapes you shared are truly spectacular, and your descriptions take us there, if only in our dreams! I looked up maps of Lombok so I could see its location, and I spotted the area you were visiting. I like knowing there are places like this in the world – thanks! Thanks Marilyn! 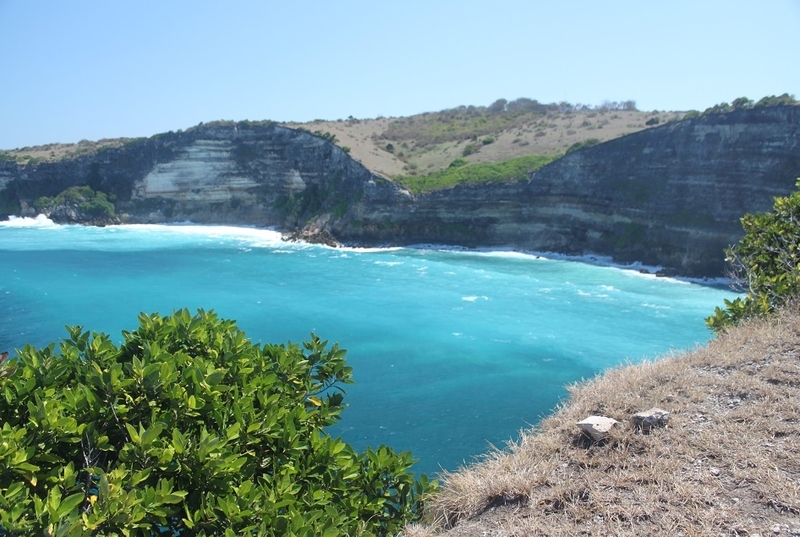 Photos don’t do it justice, you have to see those beaches yourself to truly comprehend the beauty of southern Lombok. Hopefully you’ll make it there one day! 🙂 Oh actually I also like doing that, looking up maps to find out where’s where. This reminds me that I haven’t uploaded any posts about my Lombok trip (except for Nasi Balap Puyung Inaq Esun). 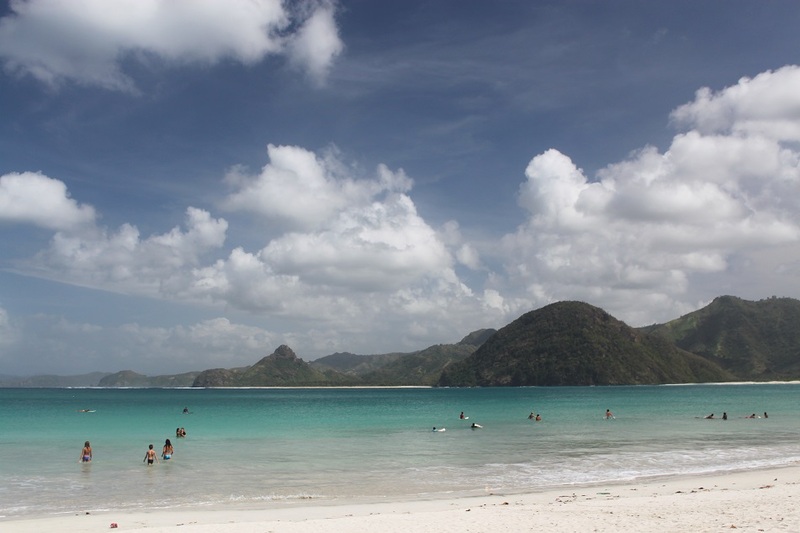 Looks amazing, definitely putting Lombok on my future travel destinations. Yes, you should Tommy! 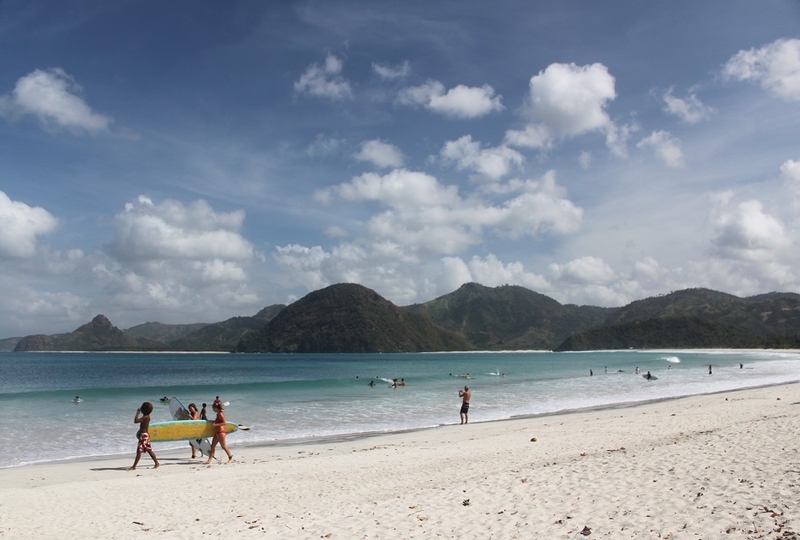 Despite lacking the infrastructure Bali has, Lombok has some of the best beaches in the region. Once again I’m in awe. Lombok is so overshadowed by its more popular neighbor that I’m actually hoping its stays that way so it doesn’t get the attention of real estate developers as quickly. Pictures don’t do justice Madhu. Visiting does! 🙂 James and I were truly blown away by the beauty of those beaches. About the message, well, at least I do my part. 🙂 Thanks a lot Madhu! You should Ayu, before things change. Thanks! Great post and awesome pictures.Thanks for sharing!!! Hi Bama, more spectacular beaches! Your photos are incredibly blue; they’re beautiful. 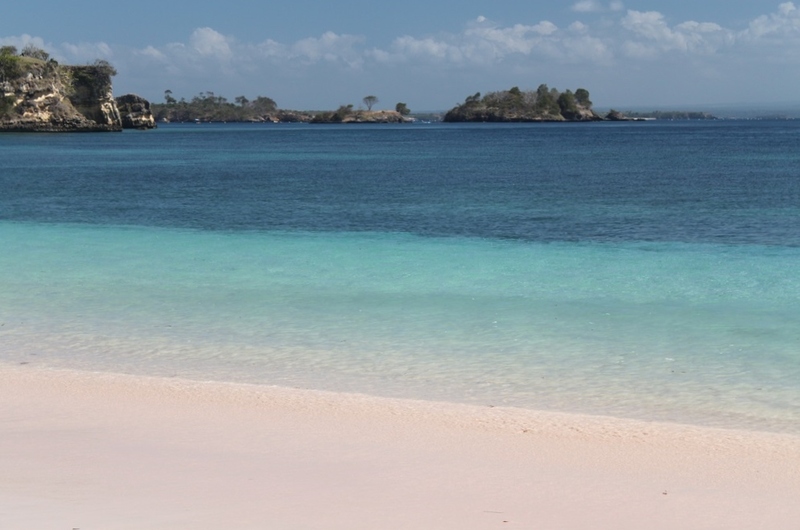 Wow, I love that Pink Beach – so tranquil and so pristine. You did a good job pointing out to your guide about the importance of not taking those dead corals. They truly are! Living in a such diverse country makes me so sad when I see people take too much from the nature without giving back. So at least what I did at the Pink Beach was the best I could do at that moment, within my own control. Thank you so much Brittania! Breath-taking photos. My jaw dropped when I saw them! Seriously awesome! Thank you so much for your kind words! I’m glad you enjoyed my photos. I wish I could go with you. You’ve got great nice photos! Thanks Christina! Maybe one day we’ll bump into each other on the road. Hi! This place look like my dreams ❤ Thank you for sharing those pictures. Greetings from Finland! 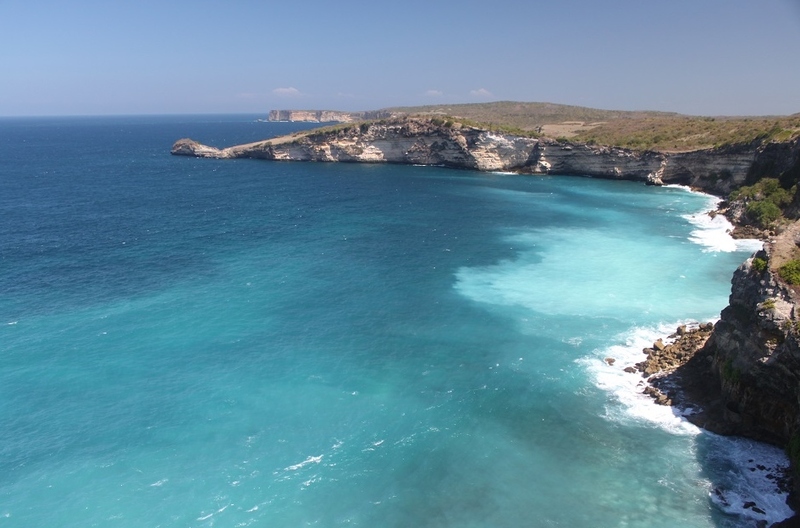 Oh you definitely should put Lombok on your wish list. It’s really worth a visit. Hi Ria. First of all I’m very impressed with your post on how to behave well among Javanese people. Oh and your ‘pets’ are cute. 😀 Speaking of traveling in southern Lombok, a staff at where I stayed also warned me about the crime. She advised me to come back from Selong Belanak before dark. Crime does happen, but as long as we use common sense I believe we shouldn’t be too worried. Thanks for sharing your tips anyway!